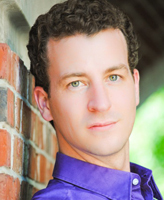 On April 1, 2013, Stephen Lancaster, assistant professional specialist in the University of Notre Dame’s Department of Music, was named the male winner at the Nico Castel International Master Singer Competition. Held annually in New York City at Carnegie Hall, the competition is sponsored by Distinguished Concerts International New York (DCINY) and the New York Opera Studio. Lancaster, who was selected from among eight finalists, received a cash prize and an invitation to perform a soloist role in a major choral work during DCINY’s upcoming concert season. By an audience vote, he was also declared the “favorite” among all the competitors. For his performance, Lancaster sang “Estuans Interius” from Carl Orff’s Carmina Burana, and “L’orage s’est calmé” from Bizet’s The Pearl Fishers. “These two pieces are very contrasting yet both dramatic,” he says. “The challenge of singing the Orff is keeping a high energy level and singing lots of high notes with practically zero recovery time. It’s like a sprint. This is not the first time Lancaster has been honored for his vocal talent: In 2012, he was the central region winner in the National Association of Teachers of Singing’s Artist Awards. Nor was this his first time in Carnegie Hall: In 2010, he debuted there as a guest with the Notre Dame Concert Band. Lancaster has also made guest appearances in Canada, Taiwan, and France. At Notre Dame, Lancaster teaches voice to undergraduates as well as graduate students in the Sacred Music at Notre Dame initiative. He is also active in sacred music as a singer, organist, and choral conductor. Although a busy teaching schedule in the College of Arts and Letters keeps him from more time on the operatic stage, Lancaster credits his students with his win at the Nico Castel Competition. “Honestly, this win belongs to my students, who keep teaching me to adapt and try again, and remind me of how much I love to sing—and need to keep on singing,” he says. This fall, Lancaster will record an album of French melodies with Martin Katz, a celebrated pianist and collaborative piano professor at the University of Michigan’s School of Music, Theatre, and Dance.